Home/Back Issues/2018/Artificial Intelligence – Who will be the Winners and Losers? Artificial intelligence (AI) is predicted to boost UK productivity by a much needed 30 per cent whilst generating cost savings of up to 25 per cent. The government is targeting for AI to add £232 billion to the economy by 2030. London is currently leading the world in AI through companies such as DeepMind and the UK’s AI sector is growing faster than the US or Canada. However, the government will need to invest heavily as the US and China are battling for supremacy in the AI field. The Internet, although a UK invention, was predominantly developed in America and as such US protocols and norms have become the global standard. The same could happen with AI whereby countries leading the way get to define laws and rules that govern this emerging field. Artificial intelligence could be the first technology area where China has a real chance to set the rules. It is not only countries that are looking to trail blaze in AI. In 2018, artificial intelligence has become central to the corporate agenda. A huge collaborative effort, combining technologies and know-how is needed for AI to fulfil its much vaunted potential. 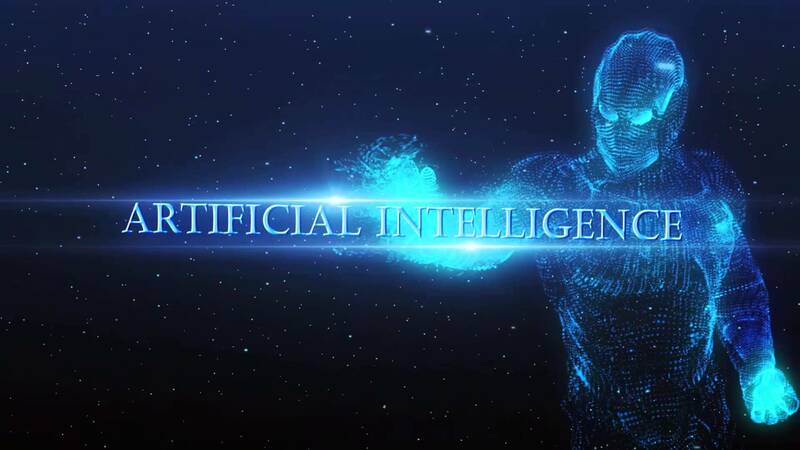 However, sitting back and waiting for AI to be perfected is not an option as any business not AI ready is likely to be left behind by competitors embracing this game changing technology. Companies need to use AI to solve a specific business problems rather than being led by the technology. 79% of companies implementing AI say it is bringing new insights and better data analysis. 74% say AI is making their organisation more creative. 71% say AI is helping to make better management decisions. Gartner estimate that AI will be incorporated into almost every new software update to hit the market by 2020. 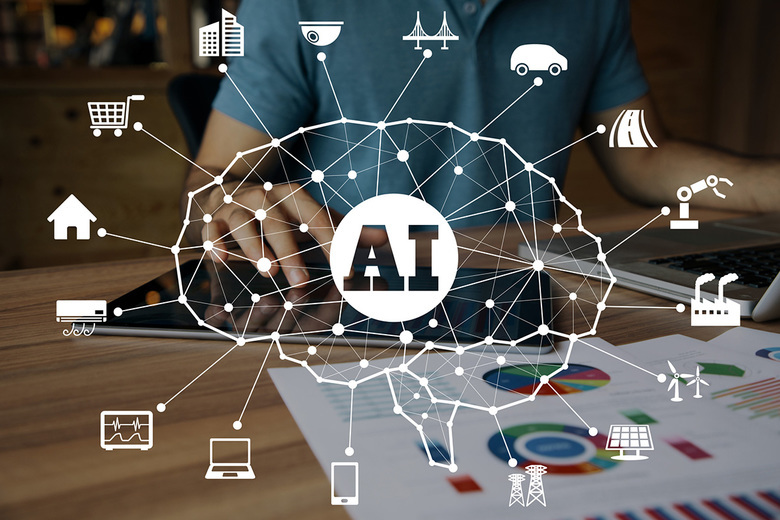 How is AI utilised in business today? One of the fastest growing areas of AI is robotic process automation (RPA) which uses software to automate repetitive tasks, such as replying to standard emails, processing customer orders or updating payroll. As powerful technology evolves, it also becomes less expensive and RPA is no exception. The addressable market for RPA is huge, the potential is a robot matched with each employee which is pretty staggering. Ultimately, everything that can be automated will be. We need to make sure the next generation are educated and prepared for jobs that cannot be automated. 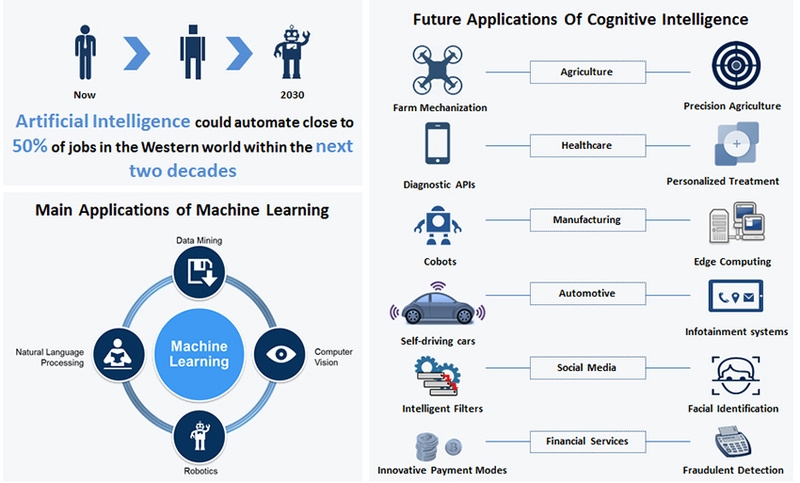 AI is a convergence of technologies including machine learning enabling computer systems to learn and continually improve processes and natural language processing (NLP) enabling machines to analyse and understand humans’ imperfect ways of writing and talking. A lesser known AI technology is natural language generation (NLG) that powers AI assistants like Google Home or Amazon’s Alexa. NLG is already widely used to translate the mass of data businesses now collect to generate intelligent, understandable and actionable insights. Complex statistics can be easily understood by everyone in an organisation without being assessed and verbally explained by analysts. This has huge potential across a range of industries including journalism, finance, business services and healthcare. Great value can be gained by organisations leveraging their data. This is an essential step in harnessing AI, because putting data at the heart of the decision-making process will enable organisations to be more effective. Man and machine can combine to achieve a much higher level of optimisation. How will businesses use AI going forward? Greater disruption will come when NLG can generate intelligent, informal dialogue for customer interaction. This is already utilised for simple tasks such as verification or handling simple enquiries. Combined technologies will allow the machine to engage with customers, to understand questions through NLP and reply through NLG. 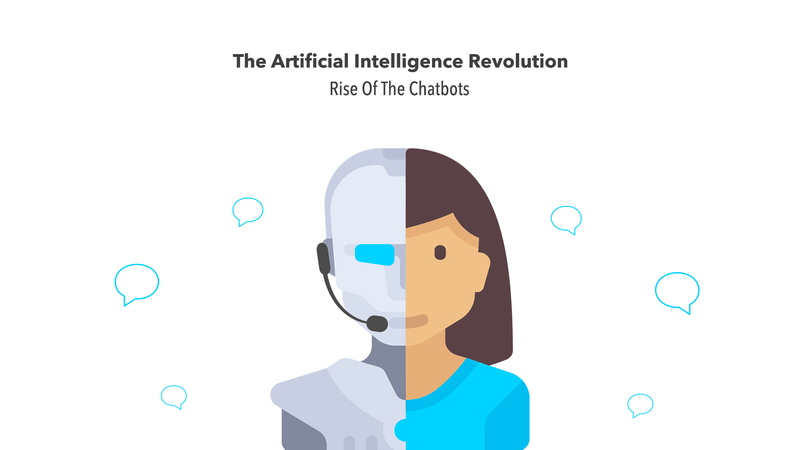 Customer and machine voice interaction is the next level of AI and will eventually improve productivity and economies of scale as staff are freed up for more complex tasks. There are many examples where people would be more comfortable and open when talking to a chatbot. Businesses have been developing intelligent AI to gain people’s trust when it comes to more sensitive subjects. A number of Healthcare AI chatbots have been developed to communicate in a friendly, empathetic and informative way helping answer questions and recognise symptoms for a range of issues from diagnosing asthma to teenage pregnancies. Here talking with a machine can remove any embarrassment from the patients meaning they feel more comfortable and interact more freely. There are hundreds of situations where humans would prefer to interact with another human rather than a machine. However, the reality is that emotionally intelligent AI is set to have a significant impact across the medical, legal and financial sectors. 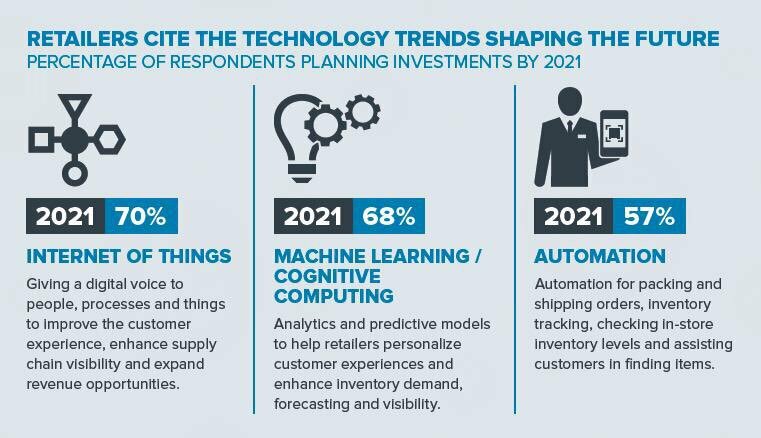 Retail is one sector undergoing an AI driven revolution with the market estimated to reach £27 billion by 2025 up from £713 million in 2016 (Artificial Intelligence in Retail Market Report 2018-2025). Amazon is leading the way, accounting for 44 per cent of all US ecommerce sales in 2017. More than a third of Amazon’s sales are driven by its machine-learning-powered recommendation algorithm. Netflix, the $100 billion entertainment company attributed 75 per cent of content consumed by its 125 million subscribers to its AI recommendation system. For smaller retailers, there is a huge opportunity to outperform competitors and keep pace with large retailers like Amazon but they’ll need to move quickly and use AI to develop smart insights into their customers’ needs and buying patterns. This can increase sales and decrease operational costs through efficiencies in marketing and staffing costs. How can AI help to educate students? There has been much debate with regards the role of AI in education. While growing numbers of primary and secondary schools are teaching their pupils how to code, this is only one small element of AI and a skill which will be outdated by the time many of the pupils enter the workforce. What is most important is that the next generation learn to embrace new technologies so they can utilise innovation in every day work practice. When it comes to equipping children for a world where AI will be enormously influential in their working lives and at home, many teachers do not have the requisite knowledge or expertise. A number of schools have drafted in tech firms to introduce AI to the classroom with limited success due to the techies not having the requisite finer teaching qualities. Collaboration is again needed between tech firms and educators developing easy to use, easy to explain materials for the teachers that don’t require a tech person to be in the room. AI can be introduced into non-computing subjects, for example teaching the students to train a chatbot how to answer questions on WW2 or using text classifiers to understand how different publications report on the same story. Machine learning can already play a vital role in setting work, in marking and assessment and can track individualised learning very proficiently. If schools adopt this technology to its fullest extent then it frees up the teachers to concentrate on developing the qualities employers across all sectors crave which are essentially human. These include teamwork, leadership, listening, staying positive, persuasive presentation and interpersonal skills including managing crisis and conflicts. When choosing a career path, the next generation should start by identifying a job that cannot be automated and building creative skills that machines cannot emulate. Since 2001, CSS has been identifying early stage companies with high growth potential. Each company identified will be presented through a full disclosure placing document. The private client service provided by CSS Partners is designed to provide investors with sufficient information on the companies and a point of contact in order to ask questions. Our aim is to enable investors to make an informed decision on whether an opportunity meets their investment requirements. CSS Partners has raised over £165m for entrepreneurial companies since 2001. To learn more about how we enable private investors seeking higher capital growth to invest with confidence in innovative companies click HERE.